Another sugestion is to change the blue terran in terranx4 and terran x5. When I saw the maps for the first time, I was like what the hell are raynor's forces doing here. White was used to represent the ued in brood war so maybe make the blue terrans purple to represent the antigans mensk had liberated. We are pleased with our version of the maps, but feel free to make a playthrough of whatever you have. We can always put the link in the main thread. It does work on Mac. The mod was done through the Starcraft 2 editor, making it compatible with any system that can launch Starcraft 2. Omar: if your Starcraft 2 isn't up to date, I can guarantee that's at minimum part of the problem. Make sure you're up-to-date, and keep in mind that this mod also requires Heart of the Swarm. I checked every thing & it's as it should .. it says to me unable to open map & on opening maps in the editor I receive the message : "Unable to load map info from 'untitled map' " ... let me ask you something about the version ... I didn't update starcraft for quite some months , could that be the problem ? Great you can mod the game too but I am more inetrested in the ability to defeat the computer. Have you ever tried mission nr 2 of "Iron Fist" Terran campaign ? I cannot fefeat AI even at easy settings. Could you tell me if your mod also works on a MAC (and not only on PC) ? There is no reason according to me the mod does not work on MAC except if the mod was created for PC version only. Omar: If it won't let you open the maps even by going into the editor and hitting "test document", then you should double check and make sure your version of Starcraft 2 itself has no problems. Assuming the mod is in the right place, there is *NO* reason you shouldn't be able to open the maps from the editor. What error does it give when you try to test the documents? 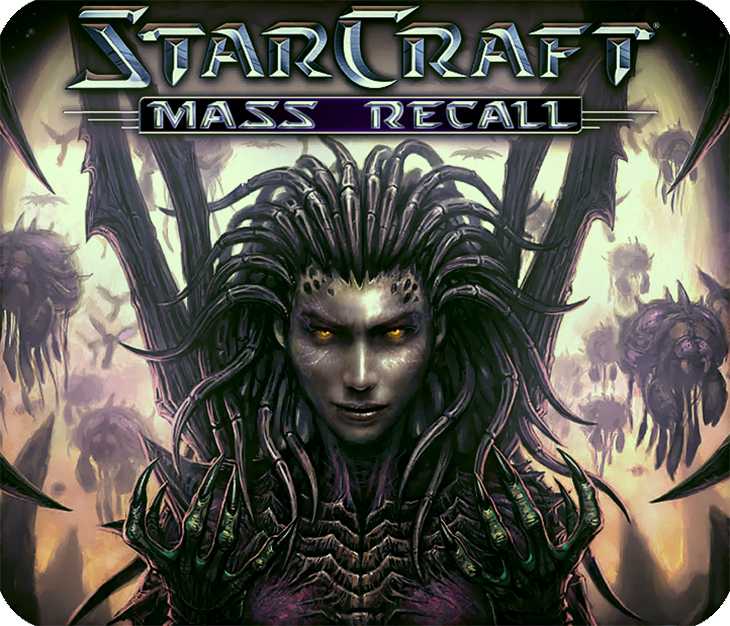 Aside from that, just make sure to remember that the folders for the campaigns are in an extra folder named 'Starcraft Mass Recall' inside the maps folder. hey guys, i love the remake, but ive done a few changes to it myself, for the mod ive found several models that im using (arclite seige tank, starbow arbiter, degull portrait), and ive done several map changes to better fit the lore because we are capable of things with this editor that we weren't in brood war.....(example, zerg 3, kel morian combine, the lore says the kel morian colors where green, how ever you couldn't have 2 factions be the same color, nor could you have "green" on "badlands" terrian", so they made the kel morians red, blue, orange, white, brown, yellow, any color but the one they accually are. in my changes i made all of the kelmorians green)........another example is in terran 5a & 5b, i replaced mengsk command center with his palace from the final HOTS mission, ive also toyed with the cutsences, example of that is terran 2, back water station, i had an Alpha Squad strike team, and the Norad II to move in and arrest raynor during the conversation between raynor and duke.............i intend on making a lets play of the campaign, along with a video with all of my changes, msg me if you show interest. A. I guess you cannot open a saved game. 2. You must open the mod and start a game as if it was a new scenario. Only then you can load your saved game. B. If you cannot lauch the game, please read the instructions manual downloadable on this website. Zergx10 has a black screen at the score screen. Yes you can; this is nothing more than a set of extra maps, and the mod files included only affect gameplay if the map specifically calls on that file, so it won't affect anything it shouldn't. Yeah, I've actually reported the same issue; they're aware of it, and are gonna (hopefully) make sure that doesn't happen for the next update. I remember that attack hitting your main base about 7 in-game minutes into the map; it's simply not reasonably defend-able that early on. I don't think the AI expands into your old outlying bases like they should, either. I was doing "Fury of the Swarm" Zerg Mission 6 Brood War on Hard, all of the sudden the computer sent like 3 ultralisks some mutas and brood lords, 3 or so lurkers, bunch of hydras and zerglings shortly after the outer bases were taken, it seemed like a little much for only a few minutes into the game. can i have this installed and still play sc2 wol and hots? Oh wow, I forgot that option existed! It's been a long time since I played SC2, thanks. Thx Gnite. Not only you open the launcher but you load the mission as you played it for the very 1st time and only then you load your saved game. Good to know! 1. Mission 1 is fine at easy settings. 2. Mission 2 named "Shipyards" is undoable by lack of pilots. I managed to use the two pilots to capture the two Battlecruisers but there is a 3rd one and I do not have any pilot left (I had only 2). What am I supposed to do ? There must be a bug, player should heve 3 pilots of there are 3 Battlecruisers. You get 2 new pilots of you lose them (I got that during my 1st attempts) but I have not lost any in my saved game... "Optical flare "ability does not work on structures, this does not help a lot. This is a mission I had also to skip in your 1st version of your mod. I sometimes get the Direct X / Open GL error when trying to load a saved game. I find that if I go to the launcher start the mission again and then load my save it works fine for me. I've used this twice when I've had a problem opening saves and its worked both times (note I'm not using the retro mod though). A BIG thanks to Jones, Telenil and the rest of the crew for allowing me to play the classic SC1 with the updated SC2 engine! One thing to note in Terran07S - I wiped out the orange base first and then the blue one (by doing this the protoss never arrive - is that meant to happen as everything has already been wiped out? I finished scenarios 9 and 10 without issue. This is really a nice campaign! Congrats to the team! The sole major remaining issue is "The Big Push", Terran opponents are far too strong. Then I shall play Iron Fist to stay with the humans (always on easy difficulty level of course).